Free logo clip art for your Ideal 80 4912 Name Rubber Stamper. Each of the 99 logos found here are tweaked in Adobe Illustrator® to make great impressions on Self Ink Rubber Stamps. Click the link. Select a logo you like. Then enter the number of the logo into the box provided. Name Stamps have many creative possibilities. Trodat Ideal 80 4912 is a nice sized Address Rubber Stamp. You'll love the quality. 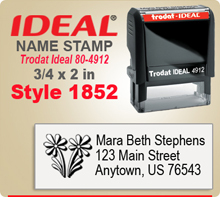 Your finished Rubber Stamp Name Stamp will look like the example shown. If order is placed by 4 PM Central your Name Rubber Stamper will ship next day. Enjoy.